On Aug. 17, Aug. 30 and Sept. 16, residents throughout Texas, Florida and Puerto Rico woke up to the bone-chilling reality of three back-to-back-to-back hurricanes— Harvey, Irma and Maria—forcing them out of their homes, which they questioned if they would ever see again. Worrisome residents were left stranded along dilapidating rooftops, watching muddied water pour into once tastefully furnished homes; numbers of household pets were aimlessly swimming the streets now disguised as bodies of water, in search of land and their families; and many frantic cries for help boomed in the midst of disaster. Our area heard those familiar cries and took action. Such as the motto “Jersey Strong” suggests, South Jersey residents, businesses and organizations stepped up and relived a strength once used in the wake of historic Superstorm Sandy—this time, putting it toward those who incurred the wrath of the treacherous hurricane trio. Camden County Freeholder Bill Moen is among those who helped. Moen and friend Michael Vernamonti were ready to jet off to Houston for a 30th birthday celebration for a childhood friend. Harvey’s sudden disturbing presence, however, created an interesting turn of events for the two. Moen received a call from Southwest Airlines regarding the cancellation of their flight, noting the Houston airport still remained under water. But that didn’t dissuade Moen from his original plans. In fact, it generated new ones. “I spoke with Southwest and they offered to fly us to Dallas for no additional charge,” he explains, “so [Vernamonti] and I flew to Dallas. Our friend Andrew, who lives in Houston and survived the hurricane on a third-floor apartment, drove four hours to the airport to pick us up.” While the three traveled to Houston the next day, Moen noticed roads still retaining anywhere from 6 to 7 feet of water and a once vibrant city that now appeared depressing. “For me, there became a point in time where I realized we were going there to celebrate a birthday, and I couldn’t enjoy myself knowing there were people suffering, who really needed our help,” Moen says. Service is within Moen’s blood. The son of a Vietnam Marine Corps veteran, Moen quickly took action and reached out to the New Leaders Council Houston chapter. He was later directed to a website, offering a map which had pinned homes nearby that were in need of servicing. It was from there that Moen and his friends found the home of a single mother with three children—one with severe autism—and a dog, who were all sharing one mattress to survive the rising water. Five hours and a colossal pile of debris later, Moen couldn’t help but notice the lack of debris on other properties. “New Jersey—specifically South Jersey— has had much experience with flooding and water damage, due to the fact that the state floods fairly easily,” says Laura Connolly, public information officer for the New Jersey State Police, who worked closely with NJTF-1 to provide water rescue for those in Texas. She says among the 28 urban search and rescue teams that exist within the national system, New Jersey remains one of them. 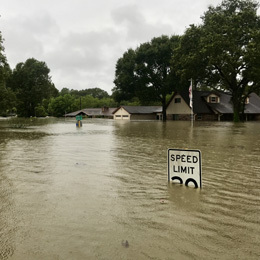 When the team arrived on the premises in Wharton County and in the surrounding areas in proximity to popular university Texas A&M, they encountered severe widespread flooding in places generally not known for retaining water. Because of this, Connolly says there were a number of nearby residents who were unfortunately unable to evacuate in a timely manner. Connolly also mentions that the team worked alongside Arizona’s urban search and rescue hazmat team, which was hired for purposes of controlling water contamination. Due to the state’s abundance in farming resources, the contamination levels in the water from farming chemicals were dangerously high. “The water was one of the worst instances the team has ever seen because it was pooling instead of rushing in and out,” she explains. “When our team came back from that operational period, they were decontaminated and had medical checks.” Among other unusual findings, Connolly recalls the team’s arguably most interesting find still to date. “The team came across a large amount of livestock and house pets,” she says. “I think in New Jersey, we’re used to the pets when doing water rescue, but not so much a large herd of cattle.” Fortunately for the team members, between the technology on board and the assistance from both the ASPCA and the National Park Service, Connolly says it allowed them to successfully gather animals to safety—cattle included. Voorhees Animal Orphanage is among several animal groups taking in animals displaced by Hurricanes Harvey, Irma and Maria. The orphanage began treating several dogs that arrived with upper respiratory issues, kennel cough and in some instances, heartworm, by placing them in a voluntary, full 10-day quarantine and going through all necessary medical procedures. Bailey notes their first—and possibly, most famous—dog received on Aug. 30, renamed Antonio after the major Texas city. Just a week after becoming available, the orphanage received an immediate adoption from a small family. But Antonio was not the only dog to find their forever home. In fact, all dogs from that group were adopted by loving locals seeking an additional family member. Among other South Jersey institutions leaving a remarkable impact on hurricaneinflicted communities is none other than the 305th Air Mobility wing at Joint Base McGuire-Dix-Lakehurst. Captains Matthew Bolado and Stefanie Culp are two of six crew members who assisted in the base’s mission working with FEMA personnel, to provide resources and help to those without either. While many South Jersey residents and organizations provided a bounty of medical, nutritional and logistical services, one business owner provided a more intangible service—giving distraught hurricane victims a glimpse into life’s happier moments. That business owner happened to be JulieAnn Morris, president of FotoBridge in Berlin. Within the first week, Morris says she received over 5,000 images alone that were in desperate need of drying, and has had packages pouring in ever since. Upon opening the stacks of saturated packages, Morris unveiled generations of cherished family photos, which she and her team worked diligently on getting dry. FotoBridge is one of only a select few photo preservation companies in the country that possesses this capability. The impact these honorable South Jersey residents made on the lives of these hurricane victims has extended well past the storm’s aftermath. Surely residents of Texas, Florida and Puerto Rico will wish to forget the destruction brought on by these unprecedented natural disasters—but they will never truly forget the charitable efforts given on behalf of South Jersey residents who lent a much needed, comforting hand.